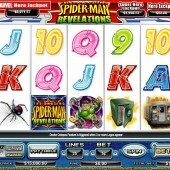 The Amazing Spider-man Revelations is a bit of a mouthful as a slot game title. 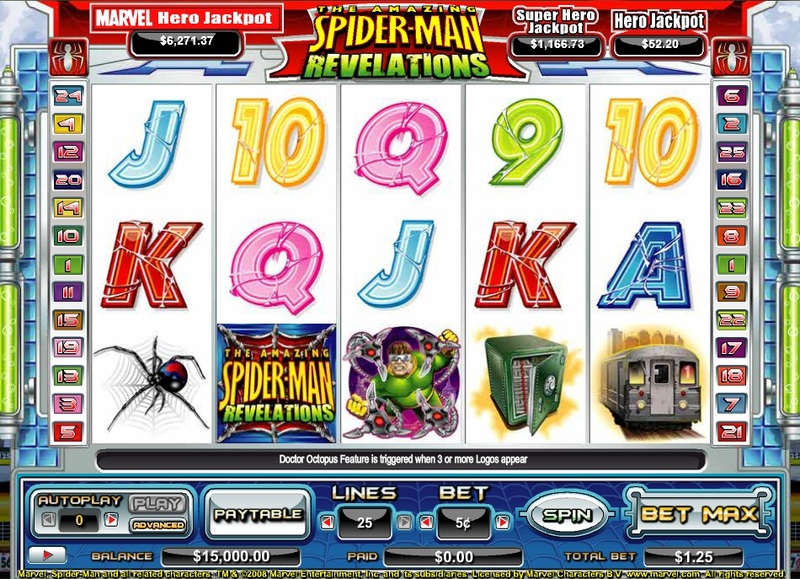 As you'd expect from a superhero-themed slot, Spider-Man Revelations has plenty of action symbols on the reels: deadly spiders, safes, security vans and bad guys are all here, plus some web-slinging 10-to-Ace icons. This is one of the simplest slots you will find, with just one main bonus round to speak of. If you see 3 or more scatters then you will trigger the bonus. You then join Doctor Octopus on the roof of the train and battle for your free spins. You will get offered a number of free spins and a multiplier and you must choose to accept or try again. If you press try again too many time you will just have to accept the final offer. Sometimes it can be good to wait, but if you play this slot regularly you will likely get into the habit of picking earlier to ensure you get a fairly decent offer. There is a progressive jackpot in the slot which comes in three levels: Marvel Hero Jackpot, Super Hero Jackpot and Hero Jackpot. The progressive is awarded completely randomly, but you have a much better chance of one of the bigger jackpots if you are playing a bigger coin. As a slot, The Amazing Spider-Man Revelations is fairly average, especially when you consider the millions that went into making the recent movies. I don’t think Cryptologic have done the Marvel characters justice but then the same could be said about games like the Green Lantern slot and the Incredible Hulk - Ultimate Revenge slot game. I do like the fact that you can win big on this game, though, and I will often play it to get the big free spins bonuses that can be won.